Here's our guide on how you can use traps to easily capture monsters of all sizes in Monster Hunter World. In all your time with Monster Hunter World, you'll be taught that capturing monster alive can be more rewarding than outright killing them, but it'll take some doing. In this Monster Hunter World capture guide, we'll be detailing everything you need to know about this tricky method in the game, walking you through how to capture monsters in Monster Hunter World, using a nice Tranq Bomb technique. 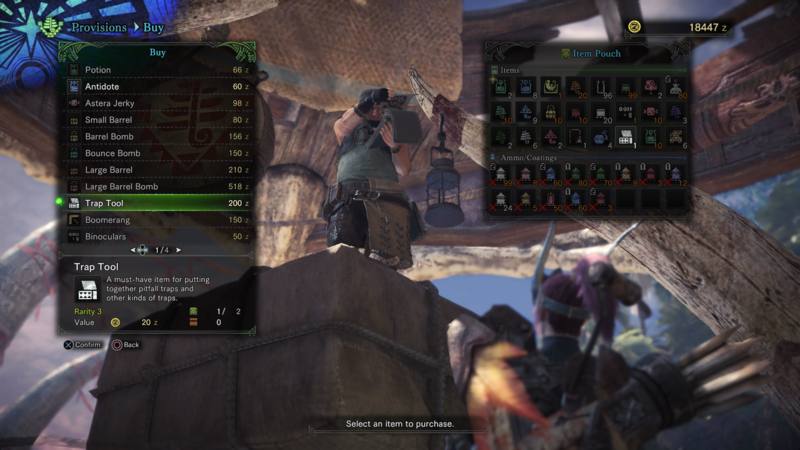 If you need anything else on Monster Hunter World, including how to upgrade your Palico’s equipment, as well as how to easily track any monster using the Scout Flies, head over to our Monster Hunter World guides walkthrough hub. As you begin Monster Hunter World, you’re only given the option of killing any and all monsters you encounter while roaming the Ancient Forest and the Wildspire Waste. Later on in the game however, you’re tasked with capturing a Kulu-Ya-Ku in the Wildspire Waste, which opens up the ability for you to capture any monsters you encounter in the future. To capture a monster, you’ll first have to weaken it. This doesn’t mean just knocking it down temporarily it breaking part of it, but you’ll instead have to keep on attacking the monster that you’re going after, until it’s visibly limping away from you. At this point, you’ll now have to sprint ahead of the monster, and lay down a trap in its path. 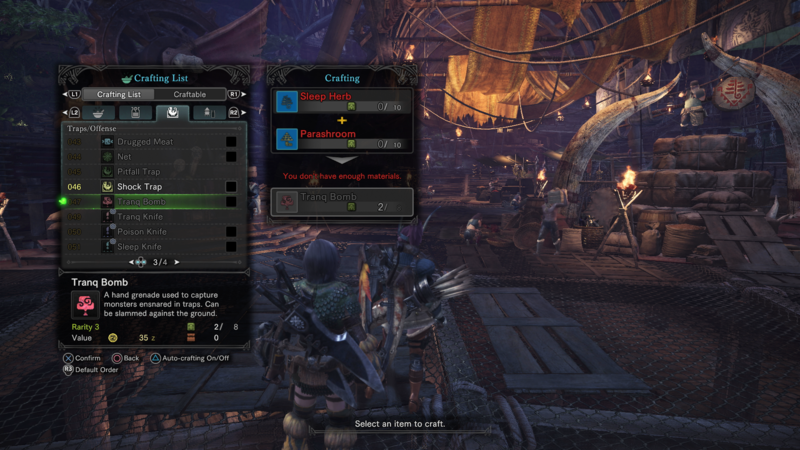 You can create a trap by bringing up the Monster Hunter World pause menu, and selecting the ‘Craft List’ option. From here, scroll over using the right trigger until you come to the Traps/Offense menu, and then scroll along to items number 26, which is the Shock Trap. A Shock Trap costs one Trap Tool and one Thunderbug to create, the latter of which must be found using the Scout Flies, but the former of which can be purchased for 200 Z from the Provisions vendor in the Tradeyard area of the main Monster Hunter World hub. Create the Shock Trap by combining the Trap Tool and Thunderbug, and you’ll have got yourself a device that’s guaranteed to snare any wounded monster, no matter their size. Simply scroll along to the Shock Trap in the quick access menu in the bottom right of your HUD, and use Square/X to place it on the ground, in the path of the monster. Your battle isn’t over just yet, as once the monster is temporarily ensnared in the Shock Trap, you’ll have to render it unconscious. For this you’ll need a Tranq Bomb, which is the crafting option underneath where you found the Shock Trap. A Tranq Bomb requires a Sleep Herb and a Parashroom however, neither of which you can purchase from a vendor, so you’ll have to use the Scout Flies to scour your surroundings for the two items. Once you’ve crafted a Tranq Bomb in MHW, you’ll have to stand as near to the head of the monster as possible, with the Tranq Bomb selected on the quick access menu, and press Square/X to use it. If you hit the head of the monster with the blast of the bomb, you’ll render the monster successfully captured, but if you miss and the monster recovers from the Shock Trap, you’ll have to repeat the entire process all over again. You’re actually far more likely to get elusive monster items if you capture them rather than outright killing them. Although it’s an extra bit of work for you to capture a monster, you’ll be rewarded with rarer items like an Anjanath Pelt or a Tobi-Kadachi Membrane, meaning you can craft higher level weapons and armor items in the Workshop.